I’m really please to announce that Hunted and Stuffed will have a stall at the launch of Make It Grow It Sell It in Brixton this Saturday 10th Sept. You can find out more at their website. Come down to Station Road and say hello! 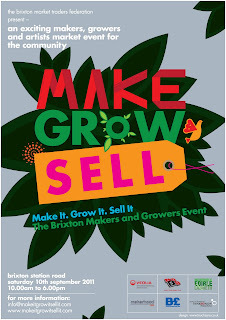 “The Brixton Market Traders Federation is very proud to launch Make It Grow It Sell It – The Brixton Makers market event for the community. Here you’ll find beautifully made arts, craft, food, homegrown plants and flowers. We’ve also got live music and fun workshops.